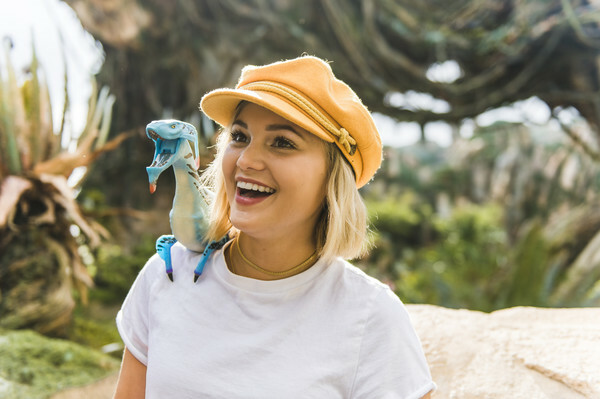 In this handout photo provided by Disney Parks, Hollywood Records artist and actress Olivia Holt poses with a banshee after riding Avatar: Flight of Passage at Pandora - The World of Avatar, located at Disney's Animal Kingdom on December 21, 2017 in Lake Buena Vista, Florida. Holt is currently vacationing at Walt Disney World Resort, on break from filming the upcoming series, "Marvel's Cloak & Dagger" premiering on Freeform in 2018. Olivia Holt visited Walt Disney World Resort wearing a cute orange newsboy cap.